Letting Go of the Need to Be Right: What's So Wrong With Being Wrong Anyway? Most people want to be motivators toward good. Few intend to be de-motivators or put the brakes on progress and growth. Many of us, however, are living and leading in ways that inhibit progress, stifle growth, and risk relationship. Why do we feel like we always have to have all of the answers and be the star that shines the brightest? It takes some digging to discover why it's so hard to let go of what we're so sure is the right way. 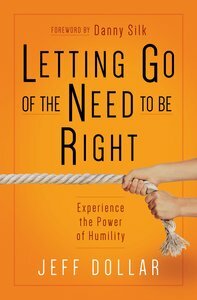 Letting Go of the Need to Be Right shows how the pressure to have all the answers and the struggle to be "right" is counterproductive, and how anyone can learn to find better answers and best practices by looking outside themselves to create what they never could accomplish on their own. About "Letting Go of the Need to Be Right: What's So Wrong With Being Wrong Anyway?" Most people want to be motivators toward good. Few intend to be de-motivators or put the brakes on progress and growth. Many of us, however, are living and leading in ways that inhibit progress, stifle growth, and risk relationship. Why do we feel like we always have to have all of the answers and be the star that shines the brightest? It takes some digging to discover why it's so hard to let go of what we're so sure is the right way. Letting Go of the Need to Be Right shows how the pressure to have all the answers and the struggle to be "right" is counterproductive, and how anyone can learn to find better answers and best practices by looking outside themselves to create what they never could accomplish on their own. JEFF DOLLAR is the senior pastor of Grace Center in Franklin, Tennessee, with his wife, Becky, and also oversees their School of Supernatural Life. They both serve with open hands and their desire is to bring encouragement to others and to see people's lives changed as they experience the love of God for themselves.